One of the first things I noticed in Rome was the bodies. 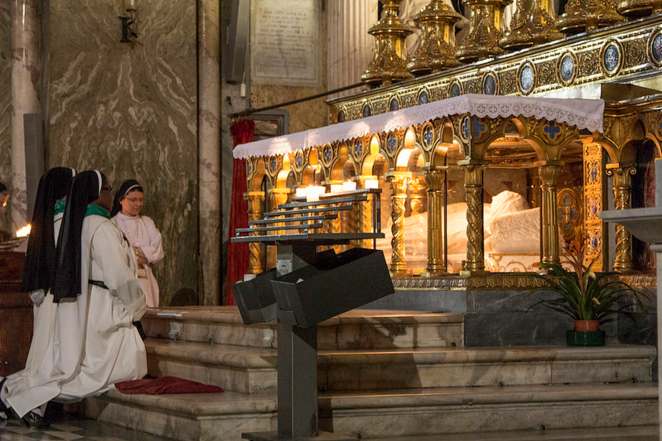 While praying in Santa Maria Sopra Minerva on my first visit, I happened to glance to my left, and there was St. Catherine of Siena, literally, lying under an altar for all to see! After that, the more I looked, the more bodies I saw. I found the practice of putting saints on display curiously edifying, but I was also impressed by the ubiquitous monuments and tombs of previous Popes, some of whom were skeletons that most human institutions would leave in the closet. Some of these monuments were quite magnificent, and their magnificence was uncorrelated with how good the honored predecessors were, or how well they Poped. The fact that the Church does not periodically remove the memorials of less-than-holy or less-than-competent Popes from her very public spaces was very encouraging to me. The Church is quite comfortable with what she is. She has had bad Popes and good Popes, bad Catholics and good Catholics, seeking life and holiness with more or less fervor, but always in need of divine grace and mercy. Her history combines horrifyingly spectacular personal failure with lasting but often untrumpeted success, and there is no point trying to clean up any true account of her members (there are enough slanderous and false accounts to keep her defenders busy). Alexander VI (1492-1503) was the most notorious of the Borgias, and a notorious libertine, fathering children and promoting their careers while Pope. He presided over a court worthy of a debauched miniseries on Showtime. Alexander inspired something close to an attempt to publically forget him — the Borgia apartments he built were closed for three centuries after his death — but his remains are entombed (along with those of his uncle Pope Callixtus II) in the Spanish national church in Rome, Santa Maria in Monserrato degli Spagnoli. Urban VI (1378-1389) presided over the beginning of the Western schism, and had his enemies (some of whom were cardinals) tortured mercilessly. His incompetence unquestionably prolonged the scandalous schism. Nevertheless, his tomb, decorated with a carved image of him receiving the keys from St. Peter, is in the Vatican grottoes. Leo X (1513-1521) was bequeathed full Vatican coffers by his predecessor, but emptied them in two short years, spending lavishly on entertainment, arts, and (to be fair) generous alms. To finance his spendthrift ways he sold indulgences, thus providing the spark that ignited Martin Luther’s tinder in 1517. Despite his intemperance and incompetence, he has a monument and tomb in Santa Maria Sopra Minerva (where St. Catherine is entombed). Boniface VIII (1294-1303): Dante (not, admittedly, an objective judge of Popes) placed him in the 8th circle of hell, for the sin of simony. The Church places him in the Vatican grottoes. The number of bad Popes is blessedly small (particularly since there are 266 to choose from), but is still too high. Nevertheless, the Church does not really hide them or pretend they don’t exist. In light of the recent university protests, I’ve been pondering those Roman monuments and the institution that maintains them. What are the differences between the institutional vision of recent protesters, who seek to cleanse from public spaces any memorials to past leaders and benefactors whose behaviors and opinions offend current commitments, and the vision of the Church, which declines to scour her public spaces of memorials to bad Popes? Does the comparison offer any insight for those in academia who would like to resist the ideological cleansing of university public spaces? I could make an immediate appeal to the supernatural mission of the Church, and the operation of grace within her, but I am interested in possible similarities across religious and secular institutions, not differences. How does the Church see herself as a human institution? I am confident that the institutional comparison between Church and modern university can be fruitful, but I am not confident that my answers to this question are complete. What I will suggest below is speculative, and I hope will generate disagreement and correction in the comments. Please help me out. Reason #1: The Church is very old. If you have been around as long as the Catholic Church, you start taking the long view. Alexander VI was a very bad Pope, but who remembers him? Showtime has reminded us of his existence (however inaccurately), but in twenty years even the miniseries will be forgotten. Unfortunately, most universities are much younger than the Church (2000 years). Perhaps 900 years is enough for mature institutional perspective, however: Oxford shows some signs of inoculation against the cleansing virus. Reason #2: The Church’s mission transcends (and will outlast) the earthly lives of her members. I grew up with St. John Paul II as inspiration and teacher, but he is already deep in the past for my children in the same way that St. John XXIII was ancient history for me. Pope Francis will someday soon (by ‘soon’ I mean one hundred years from now, so don’t think I’m in a hurry) be just another Pope of “happy memory” with a tomb in a Roman church. From the perspective of eternity, those who happen to be alive today are just the latest occupants, and will join those previous leaders whom they revile, celebrate, or ignore. To see an institution this way is to see its existence as something more than the sum of those who inhabit its offices. The Church is not John Paul II, Francis, or Alexander VI. Even a secular university can achieve this sense of transcendent mission; many of them had this sense until recently, and some still maintain it. In historical perspective, the current controversies and struggles are just another chapter. Not every historical method can sustain this historical perspective, though. It requires a certain humility in the face of the past which may not be forthcoming from a multicultural, postmodern history fully confident in its ability to unmask the past and re-engineer the present. A more humanistic history, in which human progress is possible but always fitful and prone to reversal, in which great civilizations rise and fall, allows a fairer comparison of our sins and those of the past, and a gentler verdict on historical figures and institutional forms. Reason #3: The Church knows that everyone (including priests and Popes) is a sinner. Even the Apostles were candid about their failures. When everyone is a sinner, and you are constantly exhorted to be tough on your own sins and to be compassionate and charitable toward the apparent sins of others, you are less likely to exalt your own generation at the expense of those who preceded you. As bad as Alexander VI was, there might be worse to come. Also, it appears that Alexander was truly penitent on his death bed. In Christian terms, he had a good death, and his life was a success. For all we know he is praying for us all in heaven or from purgatory. Do universities have the potential for a generous perspective, born of a consciousness of shared human fragility? I venture to say that the more truly humanistic and liberal they are, the more they will be aware that the sins of the past, however undeniable, may be nothing compared to the overlooked sins of the present. From these admittedly speculative observations, I tentatively conclude that the Church does not frantically hurry her bad Popes off the historical stage because she is humble about her mission and about her personnel. The mission of the Church is more than the work of any one person or generation, and any one generation lacks the perspective needed to comprehend and evaluate the whole. As a consequence, the Church does not feel empowered to pass final judgment on her previous members. This attitude does not preclude reform: the Church has a lot of experience of reform and renewal. It does, however, moderate the effects of religious reform on the institutions of the Church. The Church does not seek to become a “New Church,” to start over from new foundations; we cannot fully articulate what would be lost in such a revolution, since we do not fully understand what we have or how it was built in the first place. Other institutions, secular or not, are similar to the Church. None of us fully understands what valuable lessons and habits are embodied and passed down in the formal rules and informal habits of our institutions. We are fallible, sinful human beings whose treasured opinions and commonplace judgments may look very strange indeed from the vantage point of the future. Our inability to fully understand the good of any institution, and our awareness of the sinfulness and fallibility which we share across generations, should be embodied in our public spaces. Rome is crowded with thousands of years of memorials, but there is still space for more. Even the oldest universities have lots of space for new memorials. Leave intact the reminders of Woodrow Wilson, John Calhoun, and Christopher Columbus, and add new memorials to engage them in conversation across the quad. There will still be plenty of room for picnics and Frisbees. Since you asked for comments/criticisms…. Well I’d say learning is eternal, sacred – religious or no. Credentialing, that’s transitory. Profane, perhaps. Outside of that, too much to say. Maybe tomorrow. I recently read an interesting claim about Alexander VI, that a large part of his reputation came about because he never bothered to refute any of the stories told about him! I remember reading Warren Carroll’s history of Church, in which he appears repeatedly in the years before his election as an apparently gifted Cardinal and frequent Papabile. As far as Leo X is concerned, the text of the Papal indulgence that Luther objected to so strongly still exists and can be found if you look for it. Most Catholics today (who accept indulgences, that is) would find it unobjectionable because it requires the usual conditions, expects the recipient to do spiritual works and donating to the construction fund was only one option! Or in other words, the judgement of history may not be enough to judge a “good” or “bad” pope, and even the worst and most inept may someday be seen less harshly. Why does this author decide against plain speech? Why speak in such a roundabout, circumlocutionary way? It is a shame that for all the religiosity of this man, or all his pretense anyway, for all the supposed truth presented here, this “truth” must be founded upon a disavowal. Where are the words ‘black’, ‘indigenous’, ‘anti-semitic’, ‘imperialism’, ‘slavery’, ‘segregation’? If people wish to bring down Rhodes it is b/c he was an imperialist; a white supremacist who does not merit reward. Does not the Church recognize the Orthodox and their ‘popular glorification’? Their understanding that the faithful can recognize the lives that have been made glorious, glorified before God? If Wilson is to be removed it is b/c we despise segregation which he instituted in D.C. If we’re all sinners, where is the confession that slavery was wrong? The USA has never done this; and moreover, what shall be the penance? Hypocrites in the Temple ought to be thrown out so as to imitate and do righteous by our Lord.